On average, each person on the planet eats 73 pounds of potato each year. Potatoes are vegetables but they contain a lot of starch (carbohydrates) that make them more like rice, pasta and bread in terms of nutrition. Size of potato depends on variety. It usually grows 24 inches in height. Largest ever recorded potato had 18 pounds and 4 ounces of weight (enough for preparing 73 portions of medium sized French fries). Much like rice, wheat and maize (corn), potato crops are an important part the world’s diet. Edible part of the potato is underground stem, better known as tuber. Potato can produce white, red, purple or blue flowers. Color of the flower is closely associated with the color of the skin (plant with white flower has white skin). Marie Antoinette and Louis XVI used flowers of potato in decorative purposes. Potato can reproduce via seeds, tubers and cuttings. There are thousands of different potato varieties but not all are commercially available, popular ones include Russet, Yukon Gold, Kennebec, Desiree and Fingerling. Potatoes are rich source of carbohydrates (starch), vitamin C and vitamins of the B group. They also have high content of fibers and important minerals. Potatoes need to be cooked before consumption. Most popular dishes include mashed potato, French-fried potato, boiled and baked potato. While the role of genetic modification is up for debate, research has led to genetically modified potato varieties that have potential benefits such as increased protein and resistance to viruses. Green parts of potato contain substance called solanine. This substance induces toxic effects in humans. Main purpose of solanine is to protect plant from the predators. Potatoes are prone to viral, bacterial and fungal diseases. Also, they are often targeted by various insects and worms that lay eggs and eat various parts of potato. Potatoes don’t store very well after purchase but they are relatively easy to grow. Scientists developed several genetically modified potatoes in the last couple of decades. New types of potatoes are resistant to pests, able to survive in various climates and/or enriched in proteins. Potato storage facilities are kept at temperatures above 4 °C (39 °F) as potato starch turns into sugar and alters the taste below this temperature. Blue potato is a variety of potato that originates from South America. Skin and flesh of this potato are purple, but they become blue after cooking. Blue color comes from high concentration of pigment called anthocyanin. Potatoes are prepared and served in many different ways, including boiled potatoes, mashed potatoes, baked potatoes, French fries and hash browns. Potato is the first plant that was launched and successfully grown inside the space shuttle in 1995. Potato is staple food in numerous countries around the world. Great Irish Famine in 19th century was a consequence of fungal disease of potato (known as potato blight). Fast spreading disease and lack of potatoes led to nearly million human deaths. Potato is perennial plant, which means that it can survive more than two years in the wild. 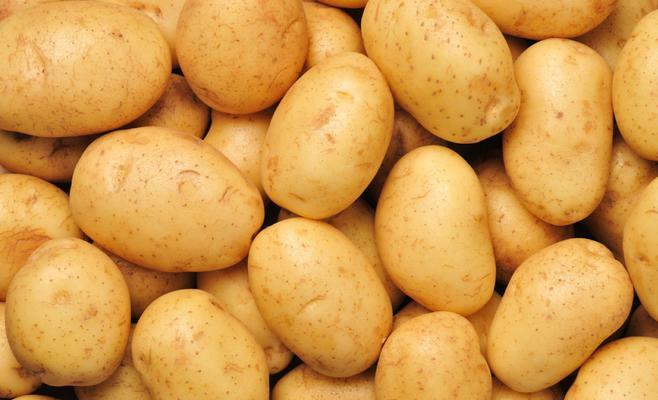 Over 300 million tons of potatoes are produced each year. Greatest amount of potato is produced in China. Despite health concerns, potato chips are one of the most common snack foods in the world with billions of packets being consumed every year. Although it shares the same name, the sweet potato is a root vegetable and only loosely related to the potato.